Big Hungry Shelby: You Say You Want a Revolution? I climbed aboard the S.S. Treadmill on Saturday morning after a dietetically-disastrous week in New Hampshire last week, and there was Jamie Oliver on CNN Headline News, talking about his Food Revolution Day. I miss his show; and actually, I’ve been thinking about it lately, because as I talk to people and they find out what I’m doing in my quest to get beach-ready this summer, I’m always taken aback when I say I’m eating tons of fruit, vegetables and no carbohydrates at dinner, and they look at me like I’m Medusa. By and large, somehow, a vast majority of Americans are woefully uneducated about what they put inside their bodies. Now, you know me, guys. I am not a health freak. I don’t believe in depriving kids of cookies or soda, and I don’t believe in depriving myself of bacon, cheese, grits, French fries, gravy, or any of the other foods that make my heart sing and my arteries clog. I don’t eat spelt bread, tempeh, whole wheat pasta, or chia seeds. But listen, God only gave me one body. There are times I need to be nice to it, and give it things it wants to run on, like spinach and apples. The fact that so many people look at me with the stink eye when I mention vegetables worries me. 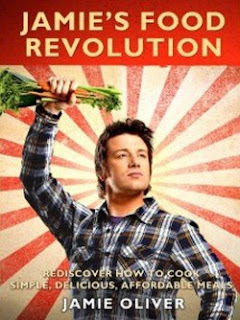 Maybe Jamie Oliver has a point, and maybe we need to read up a bit. Case in point: in NH last week, at a company conference, we reviewed our new wellness plan and unveiled a wellness challenge that I am totally going to win ($250 SpaFinder gift cert, get in my purse now). Yet at mealtimes, there was no whole fruit, only sugar-heavy melon; no boiled eggs or whole wheat products at breakfast, only sugar-laden pastries and packaged scrambled eggs. One lunch, a fried platter of fish, chicken or clams with fries was the only option. I couldn’t have scrounged up a vegetable if I’d tried. And at dinner the previous night, at which I had ordered scallops thinking they’d be a healthy alternative, I didn’t eat anything since the plate was comprised of rubbery bay scallops floating in a cream sauce and covered in cracker crumbs, white and wild rice, and winter squash with gobs of brown sugar to sweeten it; I got seconds from the antipasti appetizer bar and called it a night. This is not the fault of the conference organizers, but our food system as a whole. The restaurants and hotels serving packaged, processed smoothies and overly-sweetened vegetables and calling them healthy are to blame. So my workplace, bless its heart, is trying to get me to embrace a healthy lifestyle while feeding me fried platters of heart disease and a sundae as an afternoon snack. Get real. Incidently, this is how Little Hungry Lisa showed up to our hotel in NH. Check out all her fuggage! We need to take up a Big Hungry Nation collection and buy this girl a real suitcase. No one seemed to be distressed at the food except Lisa and me. Lisa is Dr. Gomez’s wife, so she’s totes down for the cause, and trying to lose at the same time I am. This upsetting week came on the heels of my adorable brother-in-law having to phone a friend to find out what a carbohydrate is, and a diner waitress practically calling the cops on me for ordering oatmeal with a sunny side-up egg on top of it for breakfast a couple weeks ago. It’s also important to note that, this diner, which I love, doesn’t even have fruit on its menu. They took it off because no one ordered it. If that isn’t a damning commentary on the state of our nutrition, I don’t know what is. 2. Cut stem end off each zucchini, then cut lengthwise. Hollow out with a spoon, but be careful not to punch through. Leave at least 1.4” on all sides. 3. Brown and break up sausage in a medium skillet coated in cooking spray, over medium heat. Brown and cook through completely. 4. Chop up half of zucchini pulp (mostly flesh, not seeds) and discard seeds. Add to skillet with peeled, chopped eggplant (1/2” dice), onion, red bell pepper, salt and pepper. Sautee for 5 – 6 minutes, then add tomato and pine nuts to heat through. Make sure broken up sausage and veggies are all nicely mixed up. 5. 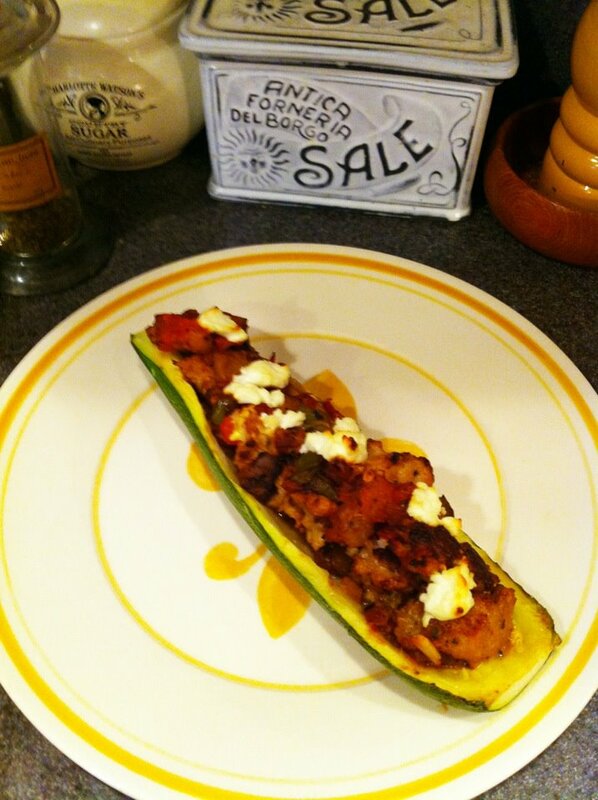 Heap filling into zucchini boats and top with goat cheese. 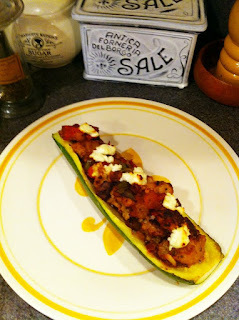 Bake at 375° for 30 – 45 min, or until zucchini is tender and goat cheese is melty and just browning. If you have more filling than room in your zucchini, the filling is top drawer with some quinoa or pasta. Also, experiment with different kinds of cheeses or fresh herbs. Basil would be great! I buy Lupo’s Hot Italian chicken sausage, and it has a pronounced kick to it. If your sausage is milder, add ½ tsp red pepper flakes to your eggplant mixture. Hot peppers do nice things for your metabolism. Now, if all these vegetables are giving you the heebie jeebies, I have some nice junk food to throw your way and get your blood pressure back to normal. In Owego, there is a magical shop called Fuddy Duddy’s. It took me a long time to stop in initially, because it seemed like just a fudge place, and fudge really isn’t my thing. You know what are my things? Chocolate covered oreos and River Rat Cheese. FD’s has both, my hungry friends. Both! They also have fresh, homemade cookies, a dynamic gift basket service, nuts, gourmet foods, Alliger’s wing sauces, chocolate covered rice krispie treats, and truffles. I stopped in a couple weekends ago to get gift baskets made for two co-workers, and had a ball chatting up owner Suzan Williams and exchanging foodie chatter. Suzan is super hands-on, and I have a feeling it’s her mom back there in the kitchen baking up scones and cookies. This place is a wonderland for your sweet tooth. If I hadn’t been doing the diet thing, I would have been all over the oatmeal cranberry cookies, which I’ve had the pleasure of devouring before. So you see, it’s all about balance. Because as much as I like stuffed zucchini with a tiny bit of goat cheese and poultry sausage, I fancy sweet treats just as much. All in moderation, my pets. Now eat your vegetables! I guess my message is: live life with abandon, but don’t abandon the things that will give you life. And for Heaven’s sake, teach your kids what a potato looks like, and get into the kitchen with them and make some real food. Too many of us get led down the primrose path of Lean Cuisines, Subway takeout, heat-and-eat freezer dinners, and ‘two-slices-of-tomato-on-my-sandwich-count-as-today’s-vegetables’ mentality. I do it too – I’ve gone entire work weeks without eating a piece of whole fruit or a real vegetable side and wondered how that happened. It happens because we’re busy, and that’s a legitimate excuse, except that excuses don’t actually make us healthier. Feed yourselves and your families real food, and indulge responsibly and with gusto! By the way, if you’re wanting to follow me down this road of wellness, you can take advantage of EatRightFitness’ deal for Big Hungry readers. Click here for more information; Dr. Gomez worked out a nice deal for ya. My hunger is big, my personality is bigger! PS: Are you following me on Pinterest? It’s easy, you just click on the “follow me” button at the bottom left of this page. I don’t want to brag or anything, but I pin pretty awesome stuff like bacon, impeccably tailored frocks, and gorgeous vacation ideas. Get some! Hellz Yeah....oh and some crushed red pepper on mine TYVM! Looks good Shelby! Sorry I missed you in the 603! Please holler when you get back in town! I'm always amazed at how people eat virtually no vegetables. I know, Steph! The same morning I got the stink eye from the diner waitress over my otameal and egg breakfast, a pageant friend, who is a grown adult, told me I looked great and asked what I was doing, then proceeded to absolutely flip out over the amount of fruit and veg I said I'm eating and replied, "Oh, I don't eat vegetables." WHAT? How do you reach the age of 50 and not eat vegetables? How is that even possible?